Atrial fibrillation AFib, is a type of heart rhythm disorder that affects 9 percent of people over the age of 65 in the U.In Atrial fibrillation heart’s upper chambers to beat erratically which at times can assume serious proportions.Therefore scientists had been trying to find ways to help patients know if they had an acute episode of disease for improving treatment and outcomes.The scientists have designed a wristband and corresponding app that works with a smartwatch which can accurately display the heart’s electrical activity and notify people with atrial fibrillation (AFib). The data of the deviceis being presented at the American College of Cardiology’s 67th Annual Scientific Session. Much more versatile than a heart rate monitor, the smartwatch wristband records a single lead electrocardiographic (ECG) tracing, visually showing the heart’s electrical activity, including the rate and regularity of heartbeats. When wearing the watch, patients can at any moment place a finger on the designated spot on the specifically designed wristband for 30 seconds, and the smartwatch algorithm will instantaneously tell the wearer if the rhythm is normal, indicative of AFib or undetermined. The blinded, prospective study enrolled 100 patients (68 years of age on average) with AFib who consecutively presented for a scheduled electrical cardioversion, a procedure that applies an electric shock to the heart to restore normal rhythm and is often done under some type of sedation or anesthesia. People who had a pacemaker or implanted defibrillator were excluded. Study participants were each given a smartwatch equipped with the special wristband and were coached on how to use it to generate the wave-patterned tracing. They then underwent a standard ECG. If cardioversion was indicated, both tests were repeated after the procedure. Bumgarner and his team compared the automated smartwatch band interpretations with the physician-reviewed standard ECG. The watch-derived recordings were stripped of identifying information, shuffled and reviewed by two blinded electrophysiologists–cardiologists trained in heart rhythm problems–to see how accurate the diagnoses were. When the automated algorithm was able to provide a diagnosis (sinus rhythm or AFib), it detected AFib with 93 percent sensitivity and 84 percent specificity when compared with the clinical-grade ECG used in clinic. When an electrophysiologist also interpreted this data, the accuracy was improved even further to 99 percent sensitivity and 83 percent specificity. Sensitivity of a test is its ability to correctly identify people with the disease and specificity is how accurately it identifies those without the disease. In all, 34.9 percent of the recordings from the watch were classified as an undetermined rhythm (59 out of 169 total). 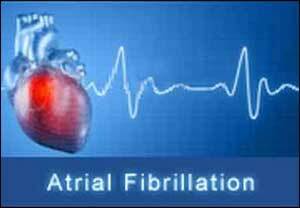 When these non-interpretable watch recordings were reviewed, the interpreting electrophysiologists were able to correctly diagnose AFib with 100 percent sensitivity and 80 percent specificity. Based on their findings, Bumgarner said there may be potential cost savings to using a device like this. Cleveland Clinic electrophysiology lab performs as many as 10 to 15 cardioversions each day. While this study involved only patients with AFib who were already scheduled for an elective cardioversion, Bumgarner said it would not be unreasonable to apply this technology in the outpatient setting as well. “The prevalence of AFib continues to rise, and many people with AFib choose to undergo cardioversion at some point to restore a normal heart rhythm, and so this technology could have wider applicability in the future,” he said. The Kardia Band, which is paired with an app that provides an algorithm for detecting AFib and attaches to a wearable smartwatch as an add-on accessory, was cleared by the U.S. Food and Drug Administration in November 2017 and is now available in the consumer marketplace. AliveCor, the company that makes the Kardia Band, provided smartwatches for the study but was not involved in the design, implementation, data analysis or interpretation of the study. Bumgarner will present the study, “Assessing the Accuracy of an Automated Atrial Fibrillation Detection Algorithm Using Novel Smartwatch Technology Among Patients Presenting for Elective Cardioversion,” on Sunday, March 11 at 9:45 a.m. ET in Poster Hall A/B. The ACC’s Annual Scientific Session, which will take place March 10-12 in Orlando, brings together cardiologists and cardiovascular specialists from around the world to share the newest discoveries in treatment and prevention. Follow @ACCinTouch, @ACCMediaCenter and #ACC18 for the latest news from the meeting.